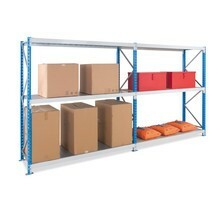 You can expand or convert your steel panel wide-span rack at any time with an add-on unit in sky blue/light grey. In this way, you can easily adapt it to your individual requirements and the frequently changing conditions in warehouse operations. 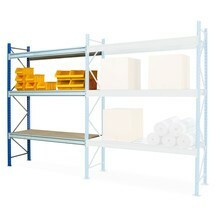 Bulky goods and other large-volume items require a lot of storage space – a double-sided wide-span rack add-on unit expands your existing base unit to create additional storage. Assembly of the rack expansion is a quick and simple process. A wide-span rack offers sufficient storage space for your bulky goods and can be freely positioned thanks to the double-sided access. You can thus easily create a flexible rack system to suit your own individual requirements. 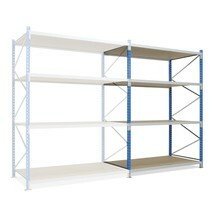 Enjoy the benefits of modern storage technology with this wide-span rack with steel panels. Simply attach the add-on unit to an existing base unit to create new storage space with utmost flexibility. The galvanised add-on unit for META wide-span racks offers more space for bulky, large-format goods. Expand your racks to suit your individual requirements and benefit from quick and simple assembly. The META wide-span rack with steel panels can be expanded with add-on units to allow you to create your own individual storage solution. As a result, you can tailor your storage system to your exact requirements. With this add-on unit for a single-row META wide-span rack, you will be well equipped to handle all changes to your storage requirements. Installation is a breeze thanks to the boltless assembly system, while the galvanised surfaces guarantee long-term durability. 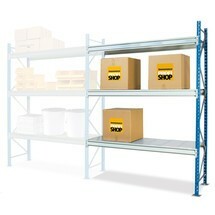 As a double-row wide-span rack, this add-on unit expands the storage capacity of your warehouse. Assembly is a breeze thanks to the simple boltless system. The frame supports are supplied pre-assembled. If your warehouse storage space is filling up rapidly, it is time to procure an add-on unit for the META wide-span rack. It allows you to expand your rack system at any time, thereby adapting the available storage to your specific requirements. The META wide-span rack add-on unit provides you with additional storage space for bulky goods and containers with European standard dimensions. 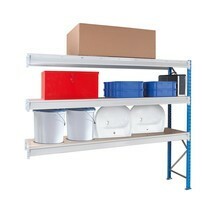 Like the base unit, the add-on unit can be easily adapted to your requirements to offer secure storage for your goods. With a wide-span rack add-on unit from META, you can quickly create additional storage space for bulky and large-volume goods. The add-on unit is easily attached to your existing wide-span rack base unit and offers the added benefit of double-sided access.